Hydrangeas grown in containers can be a beautiful, hassle-free reality. I had never tried it, because I was under the impression that the containers couldn't stay outside during the Northeast winters without killing the plant. I imagined lugging the large containers inside during the late fall and trying to find room to keep them alive through our unforgiving winters. Turns out the scenario I had in my head was wrong - but a common thought. "I think a lot of people make it harder on themselves than it needs to be," said Stacey Hirvela, the hydrangea expert for Proven Winners. "Hydrangeas need winter. If you keep it indoors, you will just be playing a losing battle." How well a hydrangea performs in your garden is tied to it's native habitat in Japan. Hirvela explained macrophylla varieties are found along the mild coastlines. "That's why along coastal areas, macrophylla varieties are blooming their brains out," she said. For example, the hydrangeas that bloom in Cape Cod, Mass. "It's one of the reasons they thrive out there." Very closely related to the macrophylla varieties is the serrata varieties (lacecap - or mountain hydrangeas). 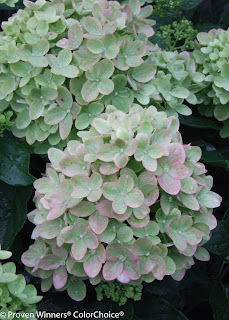 However, this hydrangea is native to the mountain regions of Japan, where it's typically colder. "They are naturally developed and better for cold climates," she said. 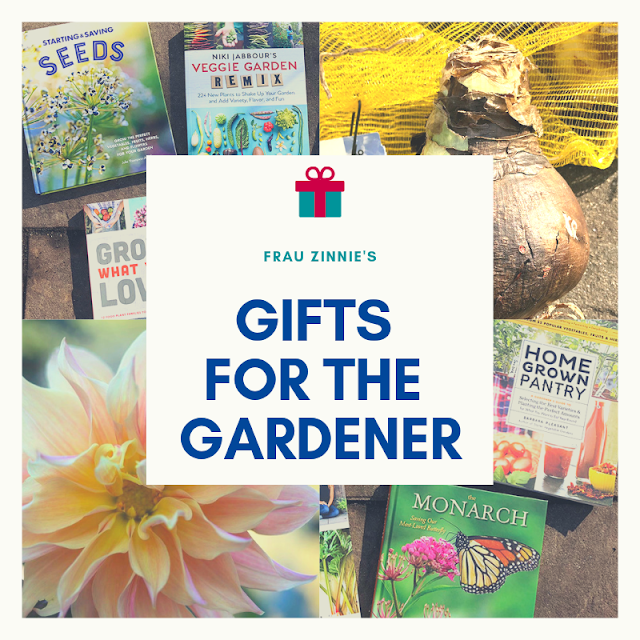 Better bud hardiness means they will bloom, even after harsh winters in growing zones 5 and 6 - which is a trending problem in recent years (read more here). "I love lacecap hydrangeas - they look more elegant," Hirvela said. "They are also great pollinator plants because they have so much more pollen and nectar exposed ... it's crazy to see how many insects visit lacecaps." 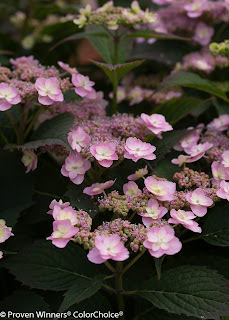 For a compact, hardy version of hydrangea serrata, Hirvela recommended the 'Tuff Stuff' series. The original version is a reblooming plant that blooms either pink, purple or blue depending on the soil conditions, and maxes out at 2 to 3 feet in size. 'Tiny Tuff Stuff' is a hydrangea that will reach a maximum size of 2 feet. 'Tuff Stuff Red' - which will be available in garden centers next year - grows only to 3 feet tall and wide and has deep pink-red blossoms. 'Let's Dance Blue Jangles' Hydrangea. 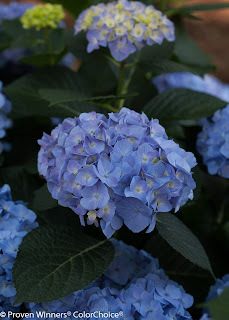 A hydrangea macrophylla that works in small spaces is 'Let's Dance Blue Jangles.' 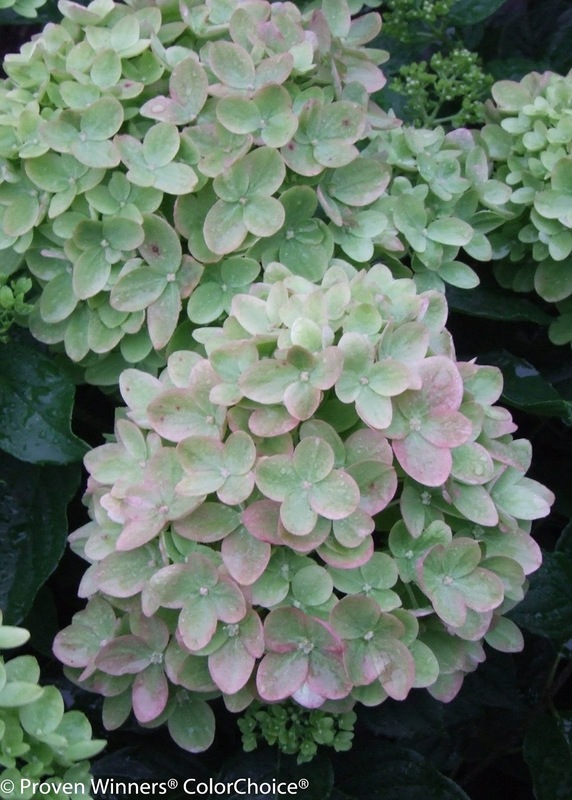 "Unlike most reblooming hydrangeas, it stays compact," said Hirvela. Planted in part sun to sun, it will grow only 2 to 3 feet tall and wide. "It has shorter internodes so it can still put on the same amount of growth but takes up less space." This hydrangea flowers on old and new wood and its large flowers turn "heavenly blue" in acid soils and "vivid pink" in alkaline soils. 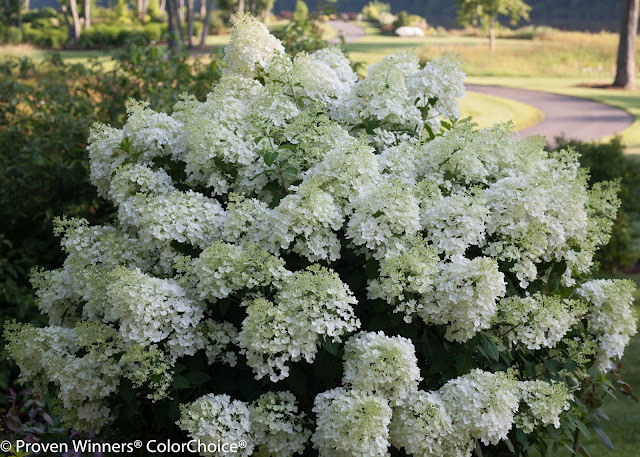 There's even a more compact paniculata hydrangea to fit smaller spaces. "If people claim they have a black thumb - these are great for them," joked Hirvela. 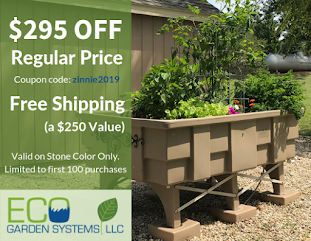 There are two varieties that stand out; one that is good for small spaces is 'Bobo,' which blooms early and grows between 2.5 and 3 feet tall and up to 3 or 4 feet wide. Another variety is 'Little Lime,' which is a dwarf version of 'Limelight.' This plant will produce green flowers that turn pink in the fall, and will grow in the 3 to 5 feet range (but in colder climates they tend to be a little smaller, Hirvela said). Any of the above hydrangea varieties can be used in a container. 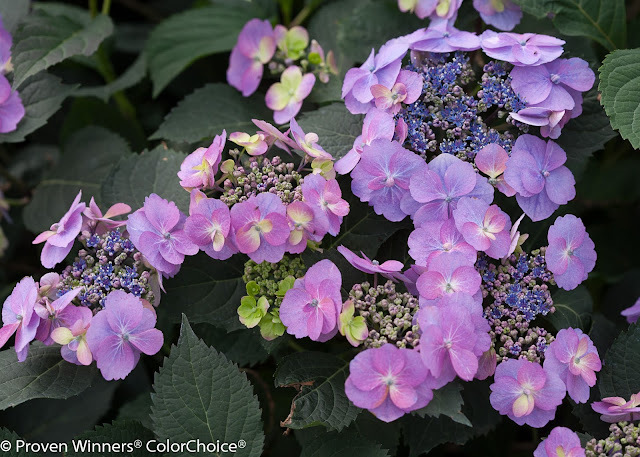 (The smaller hydrangea varieties can even be utilized as foundation plantings, or under the dining room window, without worries of blocking the view.) The trick is in picking the variety. "Because hydrangeas are hardy, they need good air circulation and need to be exposed to the changing day lengths. They do not want to be brought inside," she said. To grow a hydrangea successfully in a container, Hirvela recommended using a plant that is two growing zones hardier than the garden's growing zone (for example, for zone 6, a shrub that can survive to zone 4 would be used). "It will be exposed to more cold stress," she said. To keep the shrub outside successfully during the winter, make sure the container is weatherproof, meaning it won't crack with the freezing and thawing temperatures. 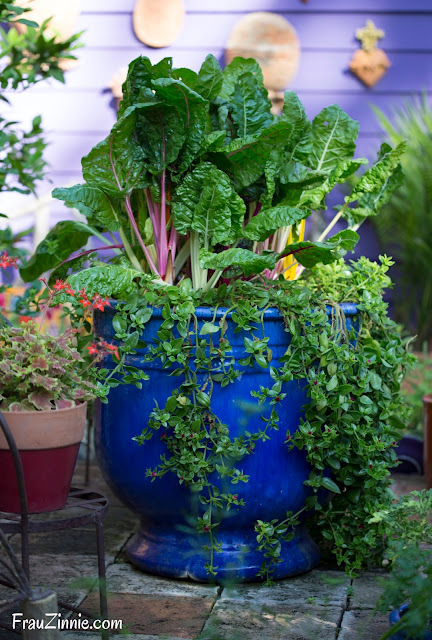 It should also be large enough to accommodate the plant as it grows, and filled with a quality potting soil. "Any time the soil is not frozen (November through December or the middle of winter), check it and water as necessary," she said. "A layer of mulch is a good idea to insulate the roots over the winter." * Photos used with this story are used with permission.